#9: The Soft Machine. Olympia Press (1961). An Installment in Jed Birmingham’s series of the The Top 23 Most Interesting Burroughs Collectibles. Desert island books versus deathbed books. Which do you think of in moments of reverie? One book is for reading when you have all the time in the world and one book is for reading when time is running short. I have always thought more about the latter: what will be the last book I ever read? It seems the more interesting, important and harrowing question. I am not a glass-half-full type of guy. For years that I have felt that book will be James Joyce’s Finnegan’s Wake. I bought my paperback copy the same summer I bought Naked Lunch and Gravity’s Rainbow, way back in 1990. That summer’s reading changed my life. I quickly read the Burroughs and Pynchon, but could only read about ten pages of the Joyce until I felt literally sick. It was that feeling of vertigo when you have had much too much to drink and it seems that your brain is doing somersaults. I was drunk on Joyce’s language. I remember reading those ten pages in bed and, man, did I suffer a major case of the bed spins. My mind was swimming. I had to put the book down and sober up. I have yet to take it up again. I still have time. Since that summer, I have been reading constantly for going over two decades and I still do not think I am ready for the Irishman. Hopefully in my ripe old age with a lifetime of reading — and thinking about that reading — under my belt, I will be able to approach him at his most demanding. Joyce stated that there was enough packed into Finnegan’s Wake to occupy scholars for an eternity. What better book to contemplate as I slip into eternity myself? 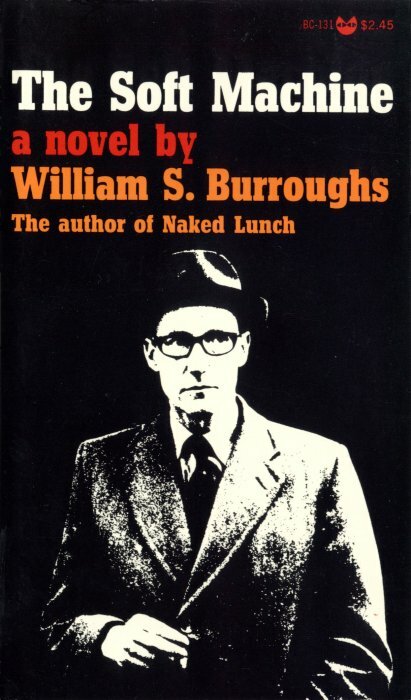 If Naked Lunch is Burroughs’ Ulysses, his extraordinary account of daily life, then the Olympia Press Soft Machine is Burroughs’ Finnegan’s Wake, his book of dream life and hallucination. 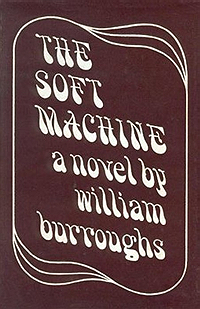 Like Wake, Soft Machine is notoriously difficult to read, written in a style and language all Burroughs’ own, although it derived from and was, in large part, inspired by, the writings of others. 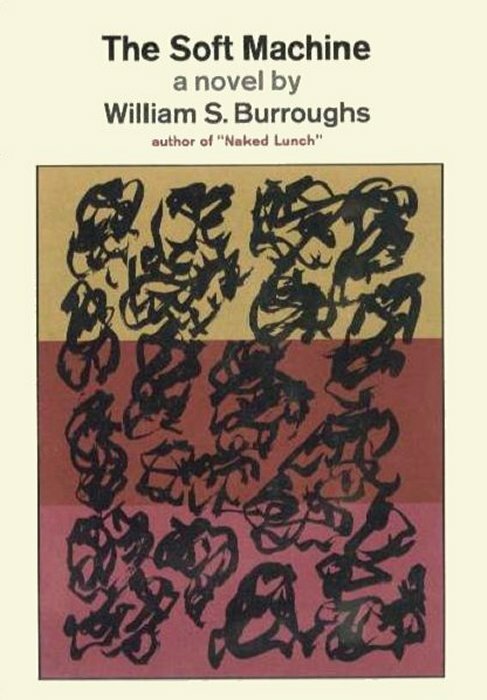 Today, Burroughs’ dream book is not read — less because it is tough going than for the simple reason that it has become very difficult to obtain. The truly illegible book is one you cannot possess. As Oliver Harris demonstrated, Soft Machine was heavily edited over three editions. The first and best — the Olympia Press edition — has never been reissued since its publication in 1961. If you want to read it, you have to make the effort to find it in an institution’s special collection or make the personal sacrifice to pay for it yourself, which will cost you several hundred dollars. So in order to be just a casual reader of the book, you have to become an amateur book collector. For me, it is worth it. 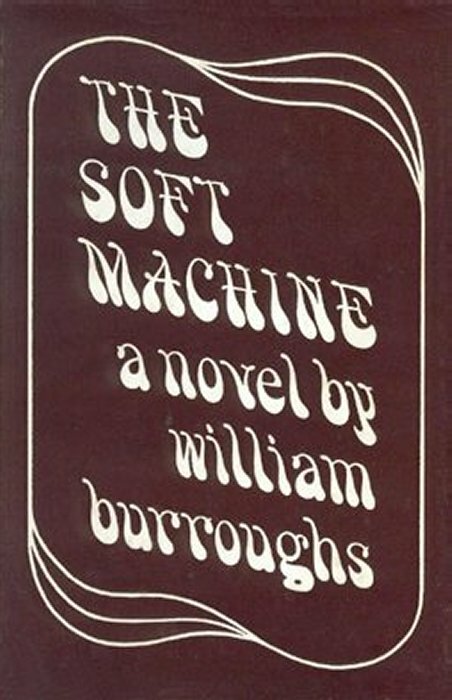 The Olympia Soft Machine will be the last Burroughs book I ever read. It is a book to be contemplated for an eternity and, as with Finnegans Wake, I am still not ready to unlock its mysteries or to fully appreciate it. I have read it several times and feel that I am just floating on its surface. Soft Machine is very deep. I have yet to release myself to its full power and to dive down into its depths, which, as everybody knows, is where all the greatest and most valuable treasure lies. To look at just the beginning and end of Soft Machine. Burroughs opens the book with a structuring device based on colors derived in part from Rimbaud’s “Voyelles.” The book’s last line — “And being blind may not refuse to hear: ‘Mr. Bradley Mr. Martin.’ Disaster to my blood whom I created. The stale rooming house of fiber flesh. (The shallow water came in with the tide and the Swedish River of Gothenberg. )” — has always reminded me of the opening line of Wake, “riverrun, past Eve and Adam’s from swerve of shore to bend of bay, brings us by a commodious vicus of recirculation back to Howth Castle and Environs.” Blood, rivers, flow, flux, time, history, genealogies, architecture, geography. When I was at Iowa as a grad student, I remember a story that one of the professors wrote his entire dissertation on that first line of Joyce’s. What could be done with Burroughs’ last? Unfortunately, the Burroughs of “[c]omplete power and confidence” had second thoughts regarding Soft Machine. 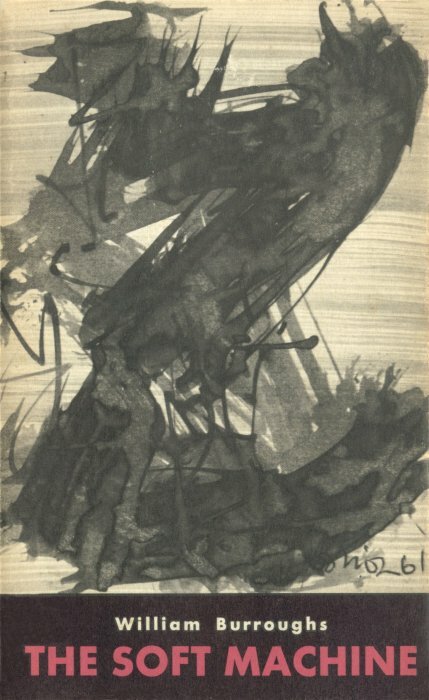 Many readers found the book illegible: “Many fans told me they found the Olympia edition difficult to read and it never sold well.” (Letter to Gysin, December 23, 1966) Even his closest reader and biggest fan, Allen Ginsberg, agreed: “I can not agree with Allen about the ending. I realize the book is experimental and difficult. What else? I can’t do it over.” (Burroughs to Gysin, May 8, 1961) I find this incredible coming from a fellow poet. It demonstrates just how ahead of his time Burroughs was. In fact, Ginsberg would never catch up poetically with the Burroughs of this period. Ginsberg never approached such prose poetry. Sadly, Burroughs listened to his deaf critics and did Soft Machine over. Evidently, going back was possible. Thus, the black-pink, fibrous authorial hand of the Olympia Press Soft Machine had to be manicured. As Burroughs writes in that December 23, 1966 letter to Gysin, while he was revising the text for Grove: “I dare say many ‘phosphorescents’ and ‘iridescents’ fell to my magic marker.” Maybe amputated is the better word. Burroughs again: “I went through the original edition and used all the material that was in any way usable and the material I added was grafted on with some care, a little scar tissue is unavoidable in such cases.” The Olympia Soft Machine bears the print of Burroughs’ amputated finger à la the Anderson affair. The Burroughs of passion, desire, and obsession. The Burroughs of poetry. Yet to prevail in the world of commerce, this evidence must be removed. Burroughs to Girodias (May 11, 1963): “You also make no mention of The Soft Machine which I rewrote at considerable expense of time and effort without any financial incentives of an immediate nature to create a more saleable property again to our joint advantage and which I feel to be quite definitely saleable.” A few years later, the final verdict: “Everyone I have talked to who has read the Olympia edition and the revised edition says they find the revised edition much more readable.” (Letter to Gysin, December 23, 1966) Scar tissue indeed; the Olympia edition died on the operating table. Burroughs as Benway at his worst. The Grove was written by the Invisible Hand of economics, thus erasing the mark of the long, white tendrils of poetry. A tragedy for generations of readers. The Olympia Soft Machine is somewhat out of time as well as being out of print. I own two copies. One signed by Burroughs and Maurice Girodias as a collectible and one as a reading copy, although this copy is also signed, in this case inscribed by Carl Weissner: “Give me another 6 months and I’ll add it to my transl. canon . . . (famous last words) – La Perla, Paris 29 June 09.” Sadly, Carl never got around to it. Yet if Soft Machine is timeless, particular copies are time-bound; my copy signed by Carl captures a special moment in my life involving Naked Lunch‘s 50th anniversary and that of my wedding. Only a true loser would coincide a honeymoon and a Burroughs conference, and only Carl would suggest discussing Burroughs at a Mexican restaurant in Paris. Over margaritas, Carl and I talked about the Olympia Soft Machine, and he spoke with passion and true insight about Burroughs as a poet and marveled at what a strange, beautiful book the Olympia edition was. The same could be said of Carl. I really miss him. So I own two copies, which is a reminder that the library is an ark. In a world increasingly flooded with information, it is odd that there seems so little that you can grab onto and so little that really grabs your attention. You have to pluck out the bibliographical flotsam and jetsam from a vast sea of data just to keep afloat. Despite all the recent restorations, it is doubtful that the Olympia Soft Machine will ever be so, since the only way to restore it is to reprint it. Until then you have to hoard it. Or maybe bootleg it. It is the nature of pirates to plunder treasures. Late in life, Burroughs championed piracy as a viable alternative community. Maybe some Captain Mission will restore the Olympia Soft Machine to Burroughs’ canon. Famous last words. Written by Jed Birmingham and published by RealityStudio on 14 February 2016. Love what you’ve been writing here. Just curious. What do you think of the “Restored Text” version of The Soft Machine that was published recently? Not being a Burroughs scholar but rather a lover of his works I (for a second anyway) was led to believe the Restored Text versions were definitive versions. Not so. 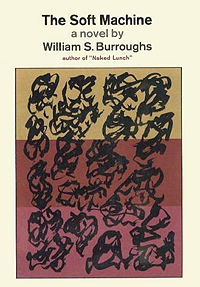 Art being malleable and in constant flux, and considering what you’ve written, it seems not quite right to have a definitive version of any of Burroughs’ writings. There are, it seems, generally agreed upon opinions as to the best/favorite/most liked by Burroughs versions that I can get behind. I just bought a restored text edition of NOVA EXPRESS and right there on first page in the acknowledgements is JED BIRMINGHAM. Well then, that clarifies a few things and brings up a few other questions. I can only assume you dig the restored text editions and once I read them all I’ll discover nothing is true, everything is permitted. Just read, right? Right. You are right to say “definitive” is a slippery term in Burroughs’ bibliography. Again, wow. The link? Excellent. Printed it immediately. Mind fed. Mind blown. Rational thought destroyed. Glad you liked it . There is more where that came from.